Dramatic forces of change continue to sweep the financial services industry. The age of the empowered customer is here and are changing the way financial products are delivered, sold, and serviced, which are making relationships more complex than ever. The explosion of data and intense competition, which is combined with slow or inconsistent economic conditions, makes it imperative for financial institutions to find new and cost effective ways to increase market share, renew customer trust, and drive profitable growth. In this new business environment, the transaction processing arm of the industry is facing increased pressure to reduce float, better manage liquidity, and provide regulators and clients with increased transparency. At the same time, the industry must effectively manage the risks that are associated with introducing customer-focused and regionalized products and services. Financial Transaction Manager enables the management, orchestration, and monitoring of financial transactions during their processing lifecycle. Financial Transaction Manager provides the capability to integrate and unify financial transactions in various industry formats (including ISO 20022, SWIFT, NACHA, EDIFACT, ANSI X12 and others). By using Financial Transaction Manager, financial institutions gain visibility into message processing, balance financial risk, and facilitate effective performance management. 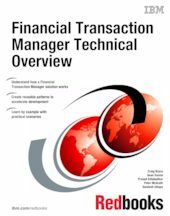 This IBM® Redbooks® publication outlines how Financial Transaction Manager is deployed to realize the benefits of transaction transparency, increase business agility, and allow for innovation that is built on a robust and high-performance environment.